Updated news stories weekly. Published online only. Headlines and reports on this page = 1 news items. Page - 8. (Sub page - 1 of 2). THE Elections on Merseyside have been very interesting this year, with local elections and the Police and Crime Commissioner elections taking place on the 5 May 2016; but in Liverpool the Mayoral Election also took place. Overall the results of the elections have not changed the makeup of the Councils and Labour still has overall control on Merseyside. Merseyside will be heading to the polling stations again soon, on 23 June 2016, for the European Union Referendum, it was interesting to see UKIP being pushed out. Is that a sign that Merseyside might vote to stay in the European Union? The full results from all the wards on Merseyside can be seen via this link. We attended Liverpool's Mayoral Elections as we feel this has huge implications on the rest of Merseyside. 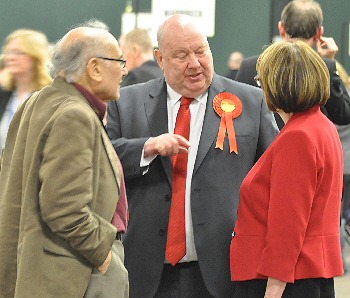 The result is that Labour's Joe Anderson was re-elected for a 2nd term in Office as the Mayor of Liverpool. He has now not only made history books as the first elected Mayor of the City, but also the first to be re-elected. Our full interview with Jo Anderson can be seen on Facebook Page and also the results being announced and some of the action can be seen on VAMPHire.com's YouTube Account As Liverpool is one of only a handful of cities to have a Mayor, TV coverage was extremely interesting to follow, following the results of the disclosure that he had won. For all of us on Merseyside, now the idea of the Mayor of Liverpool, in the eyes of many has proved successful, many have warmed to the idea of a Metro Mayor being elected next. The Metro Mayor idea is the next step in the Government's plans on devolution and could see us all, on Merseyside, voting for a Metro Mayor. Interestingly, this is something the re-elected Joe Anderson thinks will:- "make a real difference" to the people of the region. We would love to know your views on this, as the area moves yet another step closer to a motion for a Metro Mayor being made? 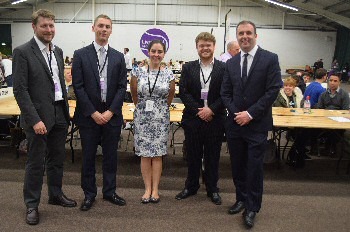 We also attended the count in Liverpool for the final and full decoration of the results for Merseyside's Police Commissioner. 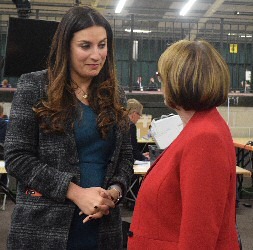 Just like the Mayoral elections, history was set as Labour's Jane Kennedy was again re-elected as Merseyside's Police Commissioner (PCC). Not only is she the 1st to be elected into that Office, but also she is the first to be re-elected. 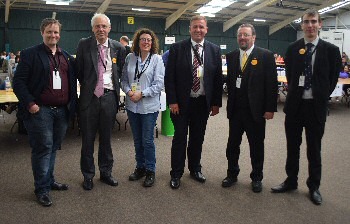 But some think the PCC election might have been pointless, as even the candidates all agreed, the coverage and information about what the PCC does has been extremely poor. Again what do you think about the PCC election information? To see our interview with Jane Kennedy please visit our Facebook Page and to watch the declaration and also acceptance speech by Jane, please see VAMPHire.com's YouTube Page now. 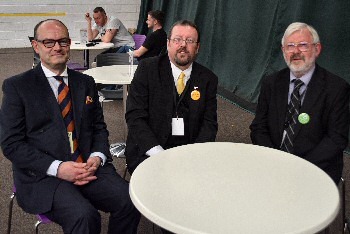 We will also have more interviews from the in Liverpool elections uploaded over the next few days on our YouTube Channel. Halton Borough Council interestingly, even though it is in Merseyside is not under Merseyside's Police and Crime Commissioner's area, so the vote they voted for the Cheshire Police and Crime Commissioner (PCC). 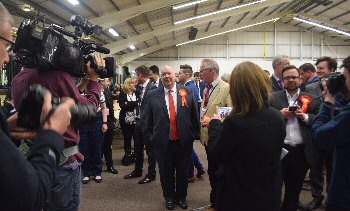 Elected for Cheshire PCC was Labour's David Keane. Also, it is worth noting the both Warrington and Runcorn, even though they fall under the Liverpool City Region are not part of Merseyside, for that reason we have not included their results on our Election Summary for Merseyside page. We suggest for those results you visit their respective local government websites. We will be bringing you a report about the referendum soon. With that in mind, as the EU vote comes ever closer, we would love to know your views, both for and against. This Referendum is one of the most important votes the UK has faced in our Country's history. Should we get it wrong, unlike the elections, we will have to live with the consequences for generation, after generations to come. So have your say and let us know your views on this very hot topic. Send them to:- News24@SouthportReporter.Com and let us know what you really think! 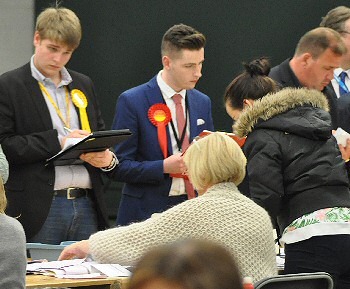 Editorial note:- "It was amazing to see so many young people doing the counting. I asked and found out many of them were from local colleges and Universities. One of them said that it had improved their ''understanding of the UK's democratic voting system'' and was a ''fantastic insight into our electoral system.'' Plus, she also added that:- ''It also helps us earn extra cash as well.'' 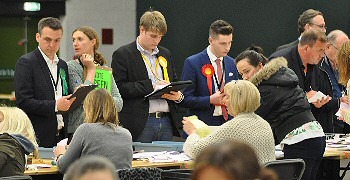 No matter what age, the people who did the count in Liverpool over a full night and a full day, all did an outstanding job. Some of them had also been working in the Polling Stations as well! Without these people we would not have a count and they will be doing this all over again on 23 June 2016." Remember you can order photos photographs from us. Help us keep this site online. Don't brake our copyright.